We are building on a site of 1280 m2 (aprox. 1/3 acre) situated at Smiths Loke,Bradwell,Gt.Yarmouth,Norfolk NR31 8DG. We purchased the plot with a old (c.1923) delapidated timber cottage whoes previous occupant (Mrs Rose) has lived there most of her life. The existing cottage had no bathroom and only 1 water tap in the kitchen. 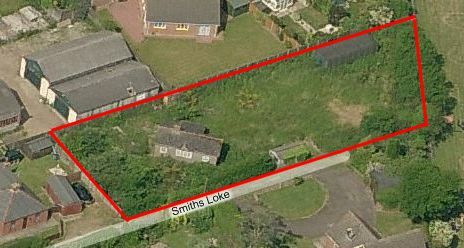 The plot is 68m long and 20m wide and runs from SE to NW with the angled boundary aligned E-W. Smiths Loke is a unadopted road owned jointly by the 6 properties ajoining it. The land has a gentle slope from SE to NW of about 1m drop on the length of the plot. This is a continuation of the general slope down from Beccles Road having a drop of 2.4m from the road. Due to this drop there is no mains sewer connection. Indeed our neighbours on Terns Gardens were raised up by 1.2m when built. The plot has a fine light sandy soil which changes to pure sand at a depth of 2m. Soon after purchase we built a large storage shed (9.6m x 3.6m) in the NW Corner to take the overflow Shauns stuff (He had moved from London the previous year).